Purse Keys and Babies: Insanity over Ice Age movie and etc. Insanity over Ice Age movie and etc. I am glad that my husband bought the Ice Age: Continental Drift. We needed the upgrade. They have been watching the Ice Age: Dawn of the Dinosaurs like over a year now so we thought it's time to switch to another one. We wanted to watch the Ice Age: Continental Drift in the theater but we didn't make it so we've waited and they finally released the DVD. Both kids are just so fascinated with the Ice Age characters. This may sound nuts... Ice Age here in our house are everywhere. It's on my iPod (digital copy), my iPhone (digital copy), my computer (iTunes) and their little t.v. (dvd disc). 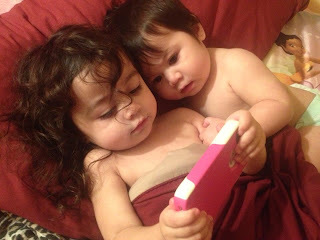 Going out with their favorite movies with us is very convenient and as a mother, it's the best of both worlds. Most kids bring their favorite toys with them, but my kids especially my son, there is only one thing in the world that will make him stop from fussing and that is their Ice Age. Since daddy brought the new addiction, Jazz is now memorizing the lines. Jj is just happy as he can be when his favorite part plays. They barely play with their toys even the ones that they just received on Christmas. Sigh. Oh well, whatever makes them happy, that's all that matters to me. That's all for now, Folks. I gotta lot of things to do. I just wish someone can help me clean the house. 1. Blogging is way cheaper than a therapist. 2. A smile warms the heart and soul. Human jungle gym is now signing off! Great insights my dear!! Perspective is the difference between a happy person and a miserable one!! Hi! New GFC follower from the Almost Friday Thursday blog hop! Would love to have you swing by and follow back if you get the chance! Hey! I am stopping by from the Thirsty Thursday blog hop today! I love your blog! I am a new follower, and if you can swing by my blog..that would be great! I hope you have a great day! LOL! To cute! I'm a new follower via facebook and would love a follow back. I'm also hosting a blog hop today if you would like to join us. And I used to love Ice Age back in the day too. But I'm pretty sure I've only seen the first one. There's gotta be about ten of them by now right? Found you through the Friday blog hop! Oh, I loved that. Great read! Beautiful children! Oh my goodness, your babies are adorable! And you might as well have been describing what happens in my house. My kiddos got the new ice age dvd on Christmas and that is the only thing they wanted to watch ALL day. I seriously know the lines to that movie now. Hi there ! I found you through that Friday Blog Hop! You're babies are precious. I'm your newest follow! So cute! I'm now following from the Friendly Friday hop. Have a great weekend! Hey Egat! I found you through the Friendly Friday blog hop and I'm super excited to be following you! Your babies are precious. I think its funny how kids with latch onto certain characters. I love Ice Age especially Continental Drift. I'm sure you'll be glad for a change lol. I hope you have a happy new year filled with many blessings! Found you through the Friendly Friday blog hop and I'm looking forward to reading your blog. Your kids are too cute! Also, blogging is most definitely much cheaper than therapy! Nice to meet you too Egat! I'm from PH too :) Mabuhay! Hi dear! Found you through Grow Your Blog Hop too. Followed you via GFC. Hope you can visit and follow me, too. Happy New Year! Your kids are ADORABLE! Loving your blog :) Following you from the Saturday Morning Blog Hop. I'd love for you to stop by and follow me back! Happy Saturday! Kids have so many options to keep them happy these days. Hi, what a beautiful family you have! I'm also going to print out your list of reminders, how lovely, just what I needed to see. Following via the Aloha blog hop. I agree that blogging is such a positive outlet! Cutie pie kids, too.